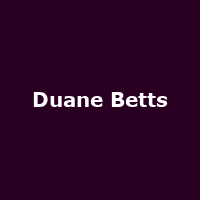 Duane Betts is an American guitarist, singer and songwriter from California - the son of Dicky Betts. He has toured with the likes of The Allman Brothers Band, as well as being part of Great Southern (his father's band) and the super-group, "Jamtown" (with G.Love, Donovan Frankenreiter, and Cisco Adler). In 2018, he announced a tour with Devon Allman as part of "The Devon Allman Project".